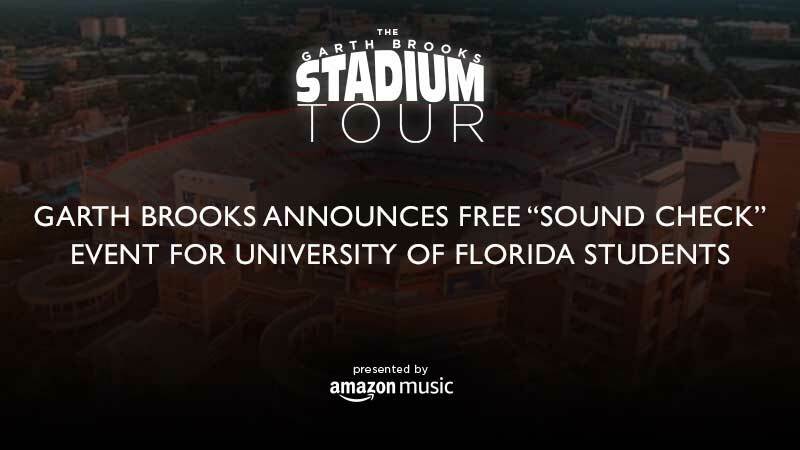 LOS ANGELES – April 4th, 2019 – Garth Brooks is giving University of Florida students a very special surprise. An exclusive “Sound Check” event will be taking place Friday, April 19th, before his Gainesville show which is on Saturday, April 20th. It will be FREE for University of Florida students! After the sound check, Garth will take questions from the students. Faculty and staff will also be able to buy specially priced tickets to this event and bring one guest for the same ticket price. There will not be any ticket pickup for the event. Faculty and staff will be sent an e-mail where they can purchase sound check tickets on line and then print their tickets. Parking for this event will be available in the Stephen C. O’Connell Center lot and all surrounding lots will be available with parking restrictions lifted after 3:30 p.m.